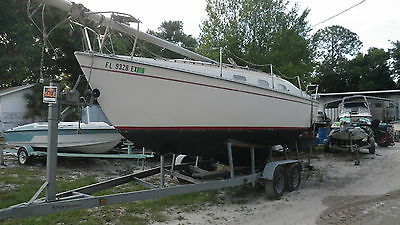 1988 Custom sail boat sailboat custom -NEW ARRIVAL!!!!! MUST SEE!!!!! - Unique and beautiful all around! - Mahogany interior - Hot Tub - Loaded with electronics. - Needs some TLC but you have to see it in person to appreciate its beauty! - Beautiful wood interior. - Hull completely insulated. - Washer and Dryer. - Vetus generator. - Can travel the world or live aboard this beautiful vessel. Great little sail boat with a cuddy cabin that will shelter 4 adults from weather or sleep 2 cozy adults. 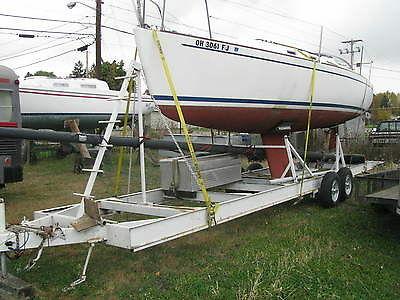 1983 year with a swing keel. Sails are in good condition. Interior upholstery is in good condition. Comes with a just serviced 8 hp Evinrude motor with less than 100 hours. Also includes 6 life vests, sail cradle, fenders, anchor, everything you need to head for the lake. The trailer has new tires and chrome wheels and custom built brackets to transport the mast. 1974 26' Pearson Weekender Sailboat, includes Nissan 9.9 two-stroke Outboard, 100% working gib, 170 Genoa and drifter sails with whisker pole. Mast and rigging in good working condition. Newly recovered cabin cushions, Sony AM/FM//CD/MP3 stereo with remote, portable toilet, 2 burner alcohol stove. Comfortably sleeps 4. Includes 4 pfd's, swim ladder, all dock bumpers and tops. I watt solar battery maintainer. Several custom upgrades. This boat is clean, stable and perfect for the new or seasoned sailor. On Lake Lanier. $2,500.00 706.867.5850 This ad was posted with the eBay Classifieds mobile app. 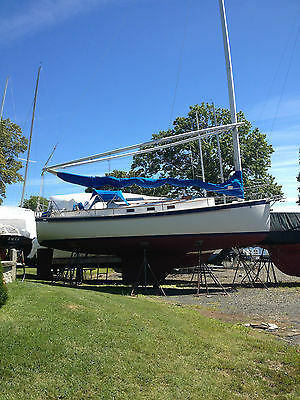 1994 Goetz Custom Sail #34 CURRENT PRICE IS A GUIDE. ALL OFFERS RESPECTFULLY CONSIDERED. General DescriptionAmerica's Cup yacht Stars & Stripes (sail number 34) is probably most famous for not winning a Cup. It wasn't because she didn't perform under pressure, but because she never got the chance. While the 24 meter yacht, designed by David Peddic and built in 1994 by Goetz Boat Works, won the right to defend the Cup, Dennis Conner chose Young America (US 36) over Stars & Stripes. The new choice was no match for Team New Zealand's Black Magic, which beat out Team Dennis Conner four times in a row. Actual ConditionIt is reported that the boat is in overall good condition and had been used for tourist day trips in Chicago area for a few years. There are dings in the carbon fiber on the bow and stern mainly due to bumping into the dock...other than that the boat appears to be in good shape. 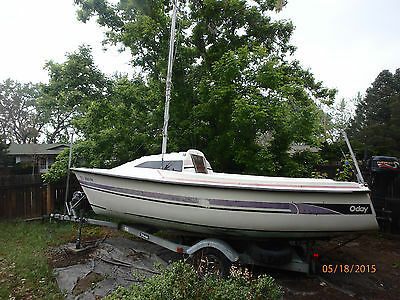 EquipmentSecond New Mast 4 -Sets of Sails Assorted Equipment and Tools in Storage 3 -12 volt Batteries 4 -Auto Bilge Pumps A trailer is not included in this sale. EnginesPlease read Motors and Machinery Disclaimer. Motors and Machinery DisclaimerNo statement of condition can be made regarding motors, engines or machinery, whatsoever. A photo may appear of the engine compartment and machinery, but it is entirely the buyers responsibility to inspect and determine their actual condition. * On occasion we receive unverified information regarding mechanical condition. Pedal Power Sailboat FULMAR-19 Trimaran -2-person boat, Built in 1998 Blazing fast, I've had it to 14 knots and cruised for hours at 8+ folding Akas. Carbon Fiber Roller-Furling Mast Sail, 80 sq ft Custom Galvanized Trailer. New tires All new running rigging SeaLeg, 4-knot Deployable Pedal Drive (SeaLeg) Rudder Control Levers in Cockpit New trampolines Spray aprons Lots of dry storage This is a very comfortable boat to sail, you sit facing forward. You can sail for hours without hurting your neck and back. The boat is steered by two hand levers by simple pushing forward pulling back with very little effort. L.O.A. 19ft. Beam 11 ft. - Folded 6ft. Weight 260 lbs. Centerboard and SeaLeg up 6" Centerboard and SeaLeg down 18" You can set this boat up less than 15 min. I have only seen three sell in the past 4 years. One sold for $11500.00 with new paint job. The others sold between $8000.00-$9000.00. 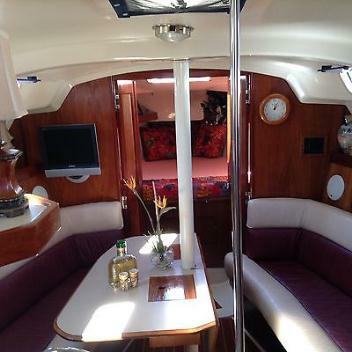 This boat is ready to sail with many upgrades and $9,000 value, asking $7,500. Or Best Offer. 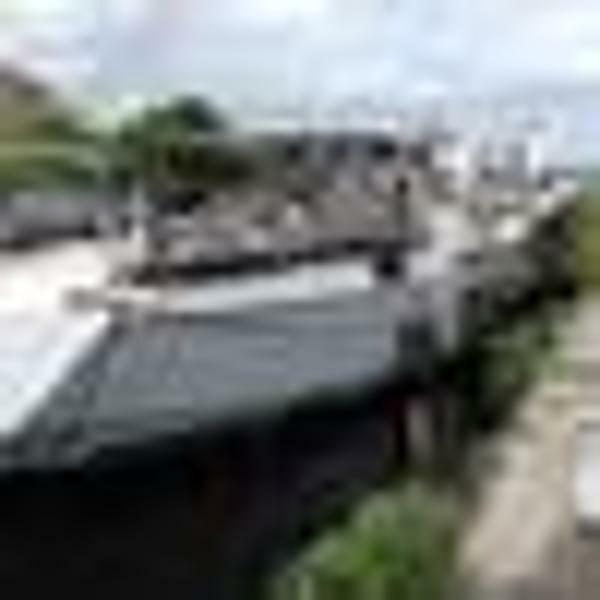 Resent Question answerThere is not a Fulmar 19 forum per se but there is quite a bit of information on other multi-hull forums if you Google Fulmar 19. There are also some Youtube videos showing the boat under sail. These boats were built by one of the biggest, trimaran boat builders in Canada. The boat was too expensive to manufacture; so they stopped production in 1998. As far as parts availability; this boat needs nothing at this point. All the hardware used on this boat is readily available at any marine, sailing company. As far as the sail goes--they were custom made for the boat and can be easily reproduced by any sail maker.Also, the Hobie Tandem Island trimaran sail would be a direct replacement and available from any Hobie dealer.This is probably one of the easiest boats to learn to sail and has great performance. One of the greatest features is the deployable sea-leg drive. If the wind dies, you just lower the drive and pedal t three or four knots. 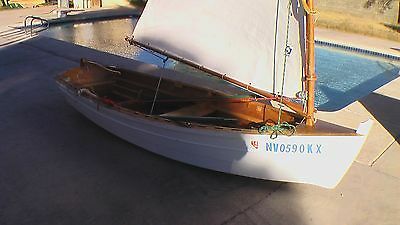 11 ft Sailing / row boat dinghy with a center board, rudder, and a sail rig including the sail. The sail is in excellent condition. 2 oarlocks and oars are mounted and included. This boat rows great! Similar to the Dyer Dhow. Unknown Make. Aft seat is missing. Good tender to tow, and provides sailing entertainment while in port. 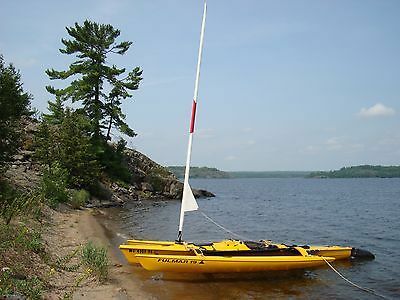 Similar to the dink, this is also a good starter sailboat for kids. 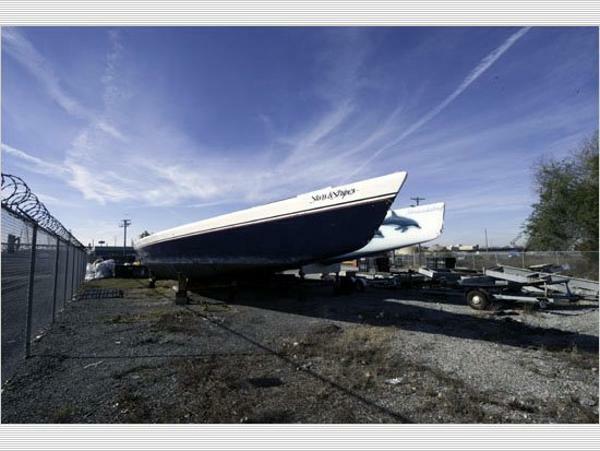 11'1" long 4'1" beam Wood hull 125+ pounds $400 Deposit within 24 hours of listing end. Deposit is only refundable, if upon personal inspection the dinghy does not meet buyer's expectations. Local delivery available for free within 30 miles of 89101. I will deliver it to Southern California (or within 300 miles) for $300 or Bay area (or within 500 miles) for $500. Delivery available within about 3-5 business days after payment in full. Free local pickup. "Just Peachy" is a stunning mid-sized cruiser with a highly functional layout that looks and feels much larger inside and out than her 35' length. All lines lead aft to the cockpit which translates to ease of handling for a couple or single handed. Hunter has designed the rig on this boat to ensure safety and real versatility in all wind conditions. The entertainment size cockpit provides for enjoyable evenings at sea as well as comfort under sail. The cockpit has a full enclosure with glass and screens which is ideal when out cruising or at anchor. Skylights thoughout the cabin, ensure that the interior is bright, elegant and inviting. The main salon has all custom leather cushions in a beautiful burgundy and cream. There is a spacious head with a hot/cold fresh water shower located in it's own space in the head. A second hot/cold freshwater shower at the walk-through transom duplicates a comfort of a much larger boat. Aft, under the cockpit, there is a huge stateroom with a queen size berth and two opening portholes. The entire interior is finished with varnished teak.There is a long list of equipment as well an extensive collection of owner's manuals, literature and receipts relating to the boat. Also, there is the original Yanmar Engine Manual (128pages) and the Hunter Factory Manual (60 pages). Dimensions: LOA: 35' Displacement: 13000#'s LWL: 29' 10" Draft: 4'6" Engine: Yanmar: 3GM30F HP: 27 Hours: 1526 Tankage: Fuel: 22 Water: 64 Holding: 15 Galley/Interior: Hatch snap on screens Custom leather salon cushions Weems & Plath brass gimbaled oil lamp Samsung 15" flat screen TV Sony CD player Drop leaf center line adjustable table AM/FM cassette radio New full sized mattress with fitted sheets in aft stateroom New 6" mattress in the forward cabin 4 JVC 6" weather proof speakers (2 interior, 2 cockpit) 3 fire extinguishers Red/blue flexible map light at Nav station wired for cable TV Adler Barbour 12v refrigerator New Wabasto marine central A/C system with remote control 6 gal hot water heater (110v & engine) Hillrange 2 burner CNG stove with oven Double stainless steel sink Microwave oven Rail mounted Magma propane grill Pressurized fresh water system Hot and cold fresh water shower in head with separate sump and pump Sink with hot and cold water Separate shower stall with seat and curtain Deck Full 5 piece canvas cockpit enclosure with windows Teak companionway doors Teak and plex companionway slides Life jackets (6) Custom cockpit floor lighting Life sling Bimini top Cockpit dodger Teak cockpit table Life lines Duel boarding gates 2 anchors with chain (Bruce & Delta) Dock lines Swim ladder at walk-thru transom Hot/cold shower at walk-thru transom Hatch cover mounted solar vents in head and main salon Full custom cabin deck cover with snaps to deck Electronics Autohelm 4000 autopilot 5" Ritchie compass Raytheon radar with dome mounted on mast and display at Nav desk Depth sounder Knot meter Kenyon VHF radio at Nav desk Apelco VHF radio in cockpit Masthead mounter VHF antenna Full instrument panel with circuit breakers Garmin 498 GPS mounter at helm with external mounted antenna Electrical Automatic alternator overide controller Battery condition gauge AC electrical system House batteries (2) Engine starting battery (1) 50' 30 amp dockside electrical cable Generator set-up to supply 120v power to vessel 120v system Inverter set up to supply vessel 120 v system from batteries 20 amp "smart" battery charger Sails and rigging 150% genoa (new) 110% jib (new) Main (good) Hood rolling furling head sails Self tailing winches (4) All running rigging lead to cockpit Main sail cover As the boat is for sale locally, we reserve the right to end the auction early.For additional information or to make an appointment to see "Just Peachy" just email. 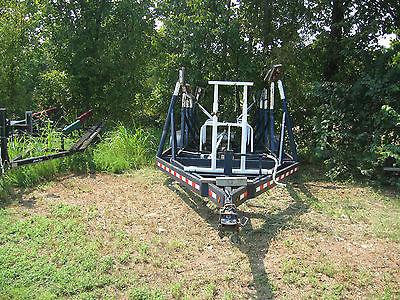 2015 ALL MARINE TRAILERS SAIL BOAT TRAILER SAIL BOAT TRAILER,ALL MARINE TRAILERS started with one Objective, to build the best quality custom aluminum boat trailers in the business. We have achieved this goal by using only the highest quality products and materials available.Custom Aluminum Boat Trailers from 15' to 50' for all boat models. All Stainless Steel Hardware,Torsions Axles, Kodiak Disc Brakes. High Quality Boat Trailers guaranteed! Contact us for further information. 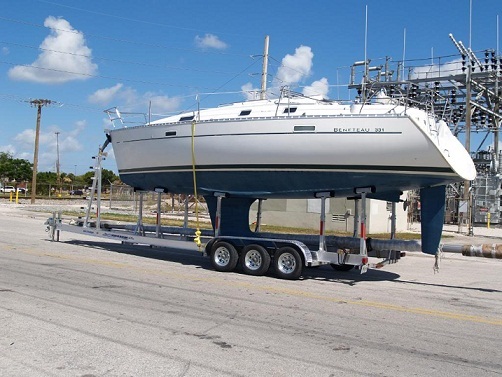 This is an extremely well built heavy duty Sail Boat trailer. It was custom fabricated in a shop near Kansas City. 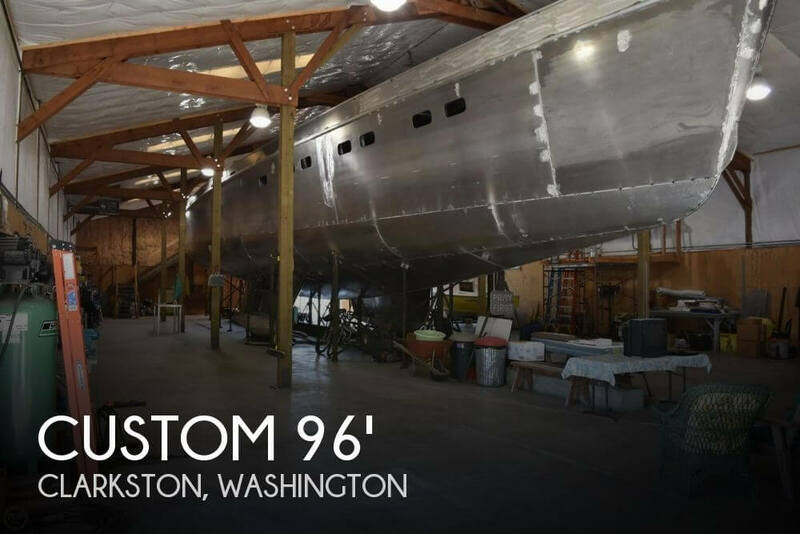 It was owned by 3 partners who used it to transport several 38-42 foot sailboats from Kansas to Oklahoma and was used one time to move a boat to Texas and one time to move a boat to Florida. That is the extent of the use of this trailer. This trailer has fairly low miles. It has 3- 7500 lb axels with 750-16- LT 6 Ply tires. If you look closley you can see that the frame on each side is double I beam constructed. The tires are in very good condition. The axels are leaf spring mounted. The trailer has electric brakes. Also included is a land and retrieve extensioin. The keel guide mounts are spread very wide so this trailer will easily accept a wing or fin keel. The heavy rubber pads are fully adjustable and also include a fine tune screw adjustment feature. The tounge jack is the same as you find on big tractor trailers. I acquired the trailer 2 years ago and pulled it from Kansas City to Oklahoma and it has been sitting since. I spoke with the shop that fabricated this trailer and was told that to produce the same trailer today the price would exceed 12 thousand dollars. This trailer is currently located in North East Oklahoma. Delivery could be arranged if needed.